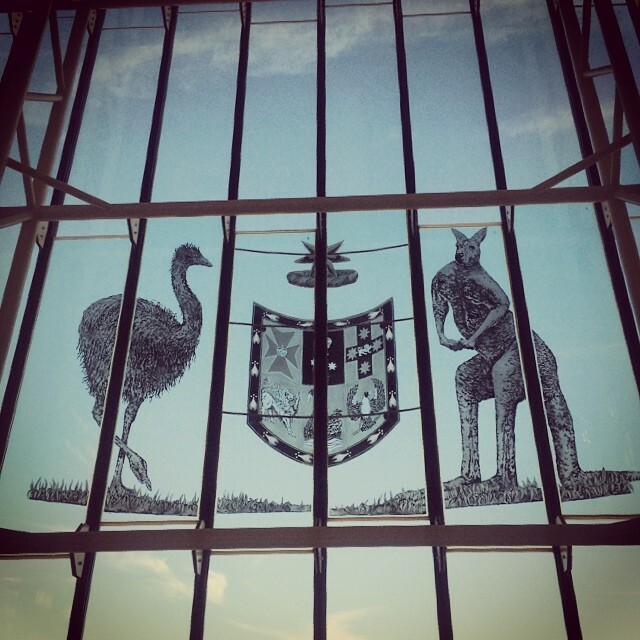 A stylised version of Australia’s Coat of Arms (above), as seen from the inside of the High Court of Australia in reverse. The official version (below) was officially adopted on the 12 September 1912. It was a redesign of the original Coat of Arms, which King Edward VII granted in 1908, after the Federation of Australia in 1901. There were objections to adopting the Kangaroo and Emu as the shield bearers, as ‘they hardly fit into the heraldic atmosphere’ and made Australia look ‘ridiculous’. It is also said that the Kangaroo and Emu were chosen because they cannot move backwards and only forward, symbolically representing Australia’s progress. In fact, these animals can move backwards, if required. The shield contains the badge of the 6 Australian states and represents the Australian federation. The seven-pointed star represents Australia’s 6 states, with the 7th point representing Australia’s territories. The star can also be found on Australia’s national flag. The image of Australia’s Coat of Arms above caught my eye as I was showing our French exchange student around the High Court on a self-guided tour.